We do not get tired of drawing characters from comics, and we hope that you will not get tired of drawing them, because another superhero is next in line. In this lesson we want to show you how to draw the Wasp from Marvel Comics. The Wasp is not only a cool superhero, but also a girl, so here we will apply the principles of drawing a female figure. Let’s start with the head, sketching it in the form of a regular oval. Next, we outline a simple line of the spine with the chest and the pelvis on it. Arms and legs will be drawn with simple lines. Now we draw two lines on the head, which further will help us draw the details of the face of the Wasp. 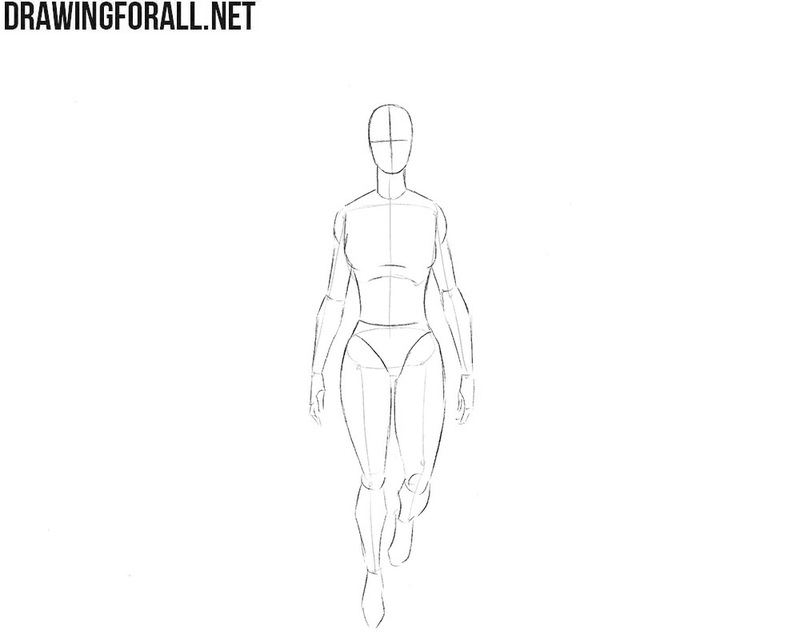 After that we go down a little lower we outline a thin neck and torso, which should be very narrow in the waist area and expand in the hips (after all, we draw a girl). In the same step, let’s outline the arms and legs. Do not try to draw too many details, only contours. To make this lifeless mannequin look more like the Wasp, let’s outline the most basic details. We start with the head, outlining the details of the face and hair. The intersecting lines from the previous step will help us in this work. Next, using smooth lines we connect the the details of the drawing to make the outlines of the body smoother. Next outline the patterns of the costume and draw wings behid the back. Now let’s get down to drawing details of the Wasp. Here we need to be as careful as possible, because we draw a face and mistakes are undesirable. Starting from the face, carefully drawing the eyes, nose and mouth. Next, gently draw the outlines of the face and hair. Delete already unnecessary guidelines and go to step number five. So let’s start drawing of the torso of the Wasp. First, we need to gently draw out the neck, which smoothly passes into the shoulders and torso. When you draw out the torso, consider all the bends of the body, as our artists did. In the same step, we need to draw the pattern on the chest and remove the lines that we already don’t need. 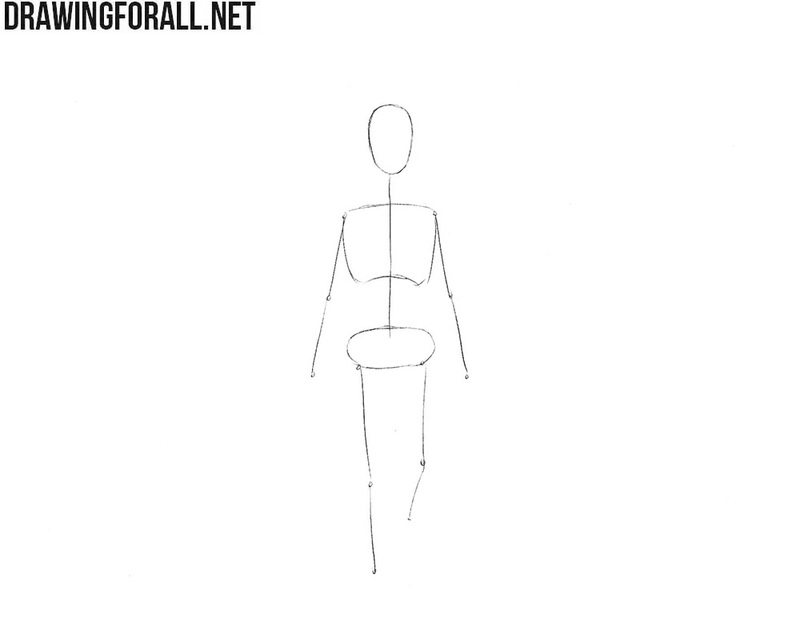 This step of the tutorial on how to draw the Wasp will be fairly simple. Here we will draw the arms and wings. First, continuing the line of trapezoids, we gently and smoothly draw out the arms and hands. The Wasp’s arms should not be too pumped, but at the same time, the muscles should be clearly visible. Next, gently draw the wings, removing unnecessary strokes. This is another fairly simple step of the Wasp drawing lesson. It is simple because here we will only need to circle the contours of the legs with the help of smooth and clear lines. After that we will need to gently erase all the lines we do not need, and the drawing will be almost ready. It remains only to draw the shadow. As we said before, it remains only to draw shadows. You can draw shadows in the style of classic comics, as in the tutorial about Wolverine, or make shadows using hatching, as we did in this lesson. Simply apply hatching in the least lit areas. If you want to make a more dense shadow, then add another layer of hatching. 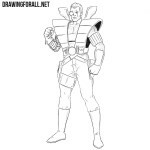 Another drawing lesson about the character of the comic book has come to an end, but you will find a huge number of lessons about supervillains and superheroes from the most diverse universes and the most different comics. 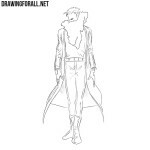 Therefore, visit Drawingforall.net as often as possible, so as not to miss a single drawing lesson.